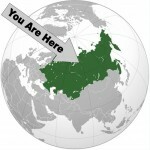 A year and a half ago, I relocated from Southern California to Moscow, Russia. Since I do not speak or read Russian, I accepted that my book needs would not be satisfied through local bookstores for the most part. This certainly has not stopped me from exploring the shelves here when given the chance, though, and I have been surprised by some of what I have found there. I had my first American YA sighting shortly after I arrived. While checking out the book section of a hypermarket, I was surprised to see Cassandra Clare’s City of Ashes face-out on one of the shelves. 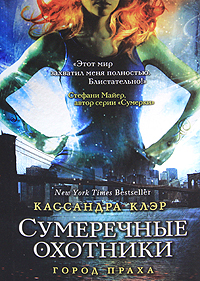 Despite the Russian text, it was easy to spot since the cover art was the same, with a fierce-looking Clary beyond the cityscape. I found City of Bones and City of Glass next to it and, over the next few months, I visited her books there more than once, just to see something familiar and recognizable. 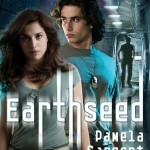 Since this first sighting, I have encountered a number of other translated YA titles. Many have retained the original cover art, making it easy for me to spot them. Others either have different artwork or they are not titles that I immediately recognize. Fortunately, I have learned the alphabet enough to sound out names, giving me the chance to have small victories whenever I can identify an author. 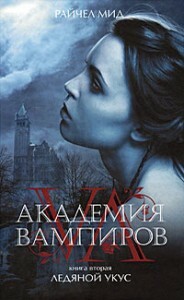 While some of the alternative covers have a similar feel to the American editions, such as Richelle Mead’s Vampire Academy: Frostbite, others do not. 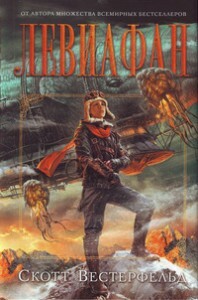 For example, the Russian edition of Scott Westerfeld’s Leviathan feels far less steampunk than either of the American versions I know. It does, however, look very similar to the covers of a large number of Russian books in the fantasy genre. There are also many movie tie-ins, which is not surprising since Hollywood films are often dubbed and shown in Russian theaters. 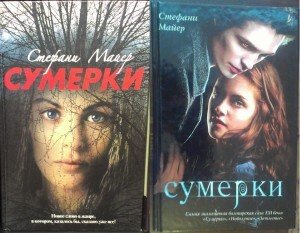 For example, I have seen two different sets of cover art for Twilight; neither one has the iconic hands-and-apple, but one of them does feature Kristen Stewart and Robert Pattinson. I also saw Cornelia Funke’s Inkheart trilogy with covers featuring Brendan Fraser and an edition of Beautiful Creatures featuring the film’s cast. For the books that have alternative cover art, the spines also tend to be graphic, which appears to be standard for Russian books. A shelf of spine-out books shows a small image, usually taken from the cover art, along with the book’s title. I have noticed this on some American texts, including the copy of The Miseducation of Cameron Post sitting next to me, but I do not think that it is as much the rule it is here in Russia. I have also found the shelving of YA books in bookstores to be different than my experiences in the States. I have not seen any YA or teen sections. Rather, I have found that YA titles are shelved by genre, alongside adult titles. That being said, they do tend to be clumped together within the genre. In particular, most of the titles I have seen “in the wild” have been categorized as fantasy or mystic. 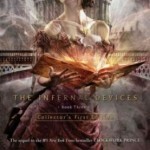 This includes a large number of titles that I think would more specifically be categorized as paranormal or dystopian. While I would never think to call The Hunger Games or Divergent “mystic,” there they were. It’s not just one or two of the most popular series that I see in these sections. One store had more than 25% of its fantasy shelves stocked with translated YA that I recognized, while another had similar titles representing about 50% of its mystic shelves. A large portion of these books happen to be vampire-centric. During recent visits to two bookstores I found titles from House of Night, Twilight, Vampire Diaries, Vampire Academy, and Vampire Kisses. In addition, I have found books by Amanda Hocking, Lauren Kate, Lauren Oliver, Terry Pratchett, and, of course, J.K. Rowling. Given how many titles are being stocked and that most of the titles have multiple copies available, I assume that they are selling. I do not recall seeing any recognizable titles being read in public, but while studying the shelves at one store, a young woman walked up and excitedly grabbed one of Lauren Oliver’s books. In another store, Veronica Roth’s Insurgent was featured on a table of new books near an entrance, which is prime promotional real estate. Much like when I first saw City of Ashes, finding YA books here makes me feel a connection to a city that can be so very different from what I know. Even with different artwork and the knowledge that certain things will be lost in translation, I know that the basis for the stories are the same. Plus, it’s always a little exciting when a favorite book has a new edition released even in English, so of course it’s fun to see them in Russian. And while I have been able to restrain from buying any for myself as souvenirs, if they ever translate Looking for Alaska, I just may have to give in. What Are You Reading, Russia? How interesting! I studied Russian in college but barely remember it, so please, don’t ask me to translate anything, LOL. A while back, a young Russian friends of our was looking for something in Russian to read. I wish I’d had one of these books in your post. She was not all that thrilled with my collection of Russian classics. I love hearing how many people have some relationship with Russian language or culture in their pasts. I am living my bit of it now and look forward to the times when it comes up in conversation and I can reflect on this experience. I know that people say there is a lot lost in translation, but I am still happy to see that these titles are being translated. Russia has a long and amazing history for appreciating the written word and I think that contemporary, popular titles have a place in there. Loved reading your article. I spent a good time in Russia in the 80s and 90s. Would love to go back. My debut MG novel is inspired from my time in Russia. How did you land there? I moved here with my husband after he was offered a position. We had not planned to live outside of the United States, so it’s been a great opportunity for adventure. 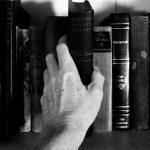 I found an amazing library and information job for myself here and get to put my love of YA literature to use regularly. I’ll be sure to link through to check out the details about your book.